I played on a 40k terrain table the other day with my Clan Skryre army and we just decided that it was the Skaven Tech Cave. It was great fun, the maggotkin had discovered its location, etc etc. Also, with regards to the skull altar, in the battle tome it does talk about one rising from the ground after a particularly heinous sacrifice. I'll try and find the passage later and post a picture. It's something I'll consider in the future, but at the moment I'm steering clear of clanrats just because I struggle to paint as is and the thought of painting 60 models, however simple, makes me feel ill. Cheers for the advice though! Thank you. Okay I've got a game on Saturday at my local games store against a guy who brings a huge khorne bloodthunder stampede. He's bringing about 30 bloodcrushers, a bloodthirster and a skullmaster? Any tips on how to deal with this monstrosity that deals mortal wounds on the charge with the following list? The only options I have available is to add in up to 2 doomwheels somewhere, I've also got a warpfire thrower team and a warp grinder team. Allegiance: Skaventide LEADERS Arch-Warlock (160) - General - Command Trait : Deranged Inventor - Artefact : Vigordust Injector - Lore of Warpvolt Galvanism : More-more-more Warp Power! Warlock Bombardier (100) - Lore of Warpvolt Galvanism : More-more-more Warp Power! Warlock Engineer (100) - Lore of Warpvolt Galvanism : More-more-more Warp Power! UNITS 6 x Stormfiends (520) 2x shock gauntlets, 2x windlaunchers, 2x ratling cannons 3 x Stormfiends (260) 1x doomflayer gauntlets, 1x grinderfist, 1x warpfire thrower 3 x Stormfiends (260) 1x Doomflayer Gauntlets, 1x ratling cannons, 1x warpfire thrower WAR MACHINES Warp Lightning Cannon (180) Warp Lightning Cannon (180) ENDLESS SPELLS Warp Lightning Vortex (100) Soulsnare Shackles (20) Emerald Lifeswarm (60) TOTAL: 1940/2000 EXTRA COMMAND POINTS: 1 WOUNDS: 104 LEADERS: 3/6 BATTLELINES: 3 (3+) BEHEMOTHS: 0/4 ARTILLERY: 2/4 I suspect I'm screwed, but any tactical ideas would be nice? I go for heroes because of my play style. I'll have my bombardier babysit the cannons, my arch warlock with the six man stormfiends and my engineer to get some gnawhole stuff. And with regards to using weapon teams. In my first game, my warpfire thrower ended up in combat, then died. In my second game, the ratling gun overcharged, rolled a double 1, missed all 4 shots, then died. So for my play style they're fun but not something I bank on, they're more there because I had the points to spare. My current Skryre list is Arch warlock Warlock Bombardier Warlock Engineer 3 x Stormfiends 3 x Stormfiends 6 x Stormfiends Warp Lightning Cannon Warp Lightning Cannon (A weapon team. Changes each game) Emerald Lifeswarm Warp Lightning Vortex It's great fun. It's hard to hold onto objectives, but the sheer destructive power is fun! It annihilated my friends Nurgle Daemons one game, and we drove to a standstill in another. So I think its viable, but be prepared to play with gnawhole shenanigans for movement. How do you guys deal with frustration or losing games? In my personal experience, I have a few options. I can either choose a small victory, like taking out a specific hero or unit in my opponents army. Or I can ride out the storm and either hope for something to turn the tide or come up with a narrative reason that I lost. It also inspires me to play the next game. I know it won't work for everyone though, so at the end of the day people have to find their own way of dealing with it. I'd always advise, however, if it really stops being fun, to just talk to your opponent and say "this has stopped being fun now, can we change things up?" Arch Warlock - Spell: More More Warp Power - Command Trait: Deranged Inventor - Artifact: Vigordust Injector Warlock Bombardier - Spell: More More Warp Power Warlock Engineer - Spell: More More Warp Power 3 x Stormfiends - Doomflayer Gauntlets, Ratling Cannons, Warpfire Throwers 3 x Stormfiends - Doomflayer Gauntlets, Grinderfist, Warpfire Thrower 6 x Stormfiends - 2x Shock Gauntlets, 2x Ratling Cannons, 2x Windlaunchers Warpfire Thrower Warp Lightning Cannon Warp Lightning Cannon Emerald Lifeswarm Warp Lightning Vortex Warp Lightning Vortex fits around a great unclean one and really helps. Followed advice given here and dumped buffs onto the 6 man range, which still benefited when they ended up in melee. Warpfire thrower ended up just luring some plaguebearers into range of my ratling cannons which was brutal. 40 plaguebearers removed by the end of turn 1. Okayy, so to update. In my game today, against Nurgle. Used open war, had face to face deployment, I set up on the back line and he set up aggressively on his front edge. Twist was lashing rain, which is -1 to hit. I thought that would cripple me. It didn't. His list: Great Unclean One (Blade and Bell) Horticulous Slimux Spoilpox Scrivener 3 x 20 Plaguebearers 2 x 3 Plague Drones Tallyband Of Nurgle It was... Horrifying. I'd almost tabled him by turn two. I got lucky and he got unlucky, but I'm starting to understand the reason why people say 'who needs friends if you have stormfiends'. Thankfully, it hasn't ruined my friendship but wow! The sheer power and weight of fire they could put down was nastyyy, especially with MMWP and warpstone sparks. A victory for the great horned rat! Okay, I've got my first game with my Skryre army this weekend and would love some ideas for Relics and Traits. Current list is: Arch Warlock Warlock Bombardier Warlock Engineer 3 x Stormfiend - Doomflayer Gauntlets, Warpfire Throwers, Grinderfist 3 x Stormfiend - Doomflayer Gauntlets, Warpfire Throwers, Ratling Guns 6 x Stormfiend - 2x shock gauntlets, 2x ratling guns, 2x windlaunchers Warp Lightning Cannon Warp Lightning Cannon Warpfire Thrower Team Emerald Lifeswarm Warp Lightning Vortex This list seemed insane enough to be great fun, with some more more everything going off, and I really don't want to paint 100 clanrats or shell out for a gazillion acolytes. Any tips, tricks or suggestions of strategy, spells, relics... Everything? Kharadron Overlords Aether-Golems. Give us a big nasty drop pod. "If this unit drops from a skyvessel, it does D3 wounds to a unit within... whatever" Grundstok Close Troops - Armored Troops with close quarters weapons. Give me a 5 man unit that can do a little bit of punch? I may be being blind, but I can't see the points limit of this tournament? Daughters of Khaine have an ability where they can delay a units attack until the end of the combat phase. My question is this. If I destroy a unit with my Ironjawz, can I then select the delayed unit with the Smashin and Bashin rules or is that unit out of the combat phase entirely until the end? I actually dropped my Grimwrath Berzerker while crossing the road the other day. I figured he was a goner but looked back after the traffic to find him still standing, still in one piece. I was amazed. In the Ironjawz book, it talks a lot about Gordrakk and the fact that he's attempting another Great Waagh. I, personally, could see this becoming an option for a soup book. 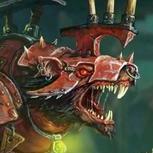 Greenskins, Ironjawz, maybe even Bonesplitterz all under Gordrakk's banner?